30-100mm in diameter, conic to convex, expanding to broadly convex and eventually flattening with age with a pronounced, persistent broad umbo; surface smooth, viscous when moist, covered by a separable gelatinous pellicle; chestnut to ochraceous brown to caramel in color often becoming pitted with dark blue or bluish black zones, hygrophanous, fading to light straw color in drying, strongly bruising blue when damaged; margin even, sometimes irregular and eroded at maturity, slightly incurved at first, soon decurved, flattening with maturity, translucent striate and often leaving a fibrillose annular zone in the upper regions of the stem. Ascending, sinuate to adnate, brown, often stained info-black where injured, close, with two tiers of lamellulae, mottled, edges withish. 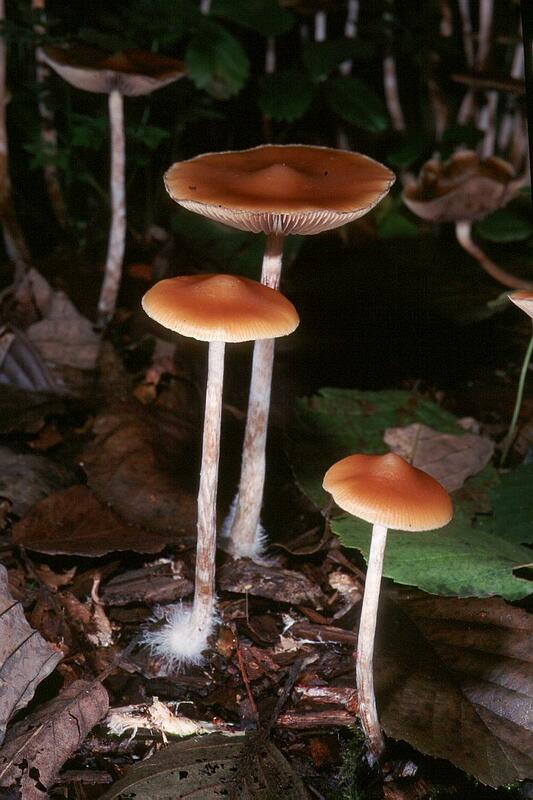 90-200mm long by 3-6mm thick, silky white, dingy brown from the base or in age, hollow at maturity. Composed of twisted, cartilaginous tissue. 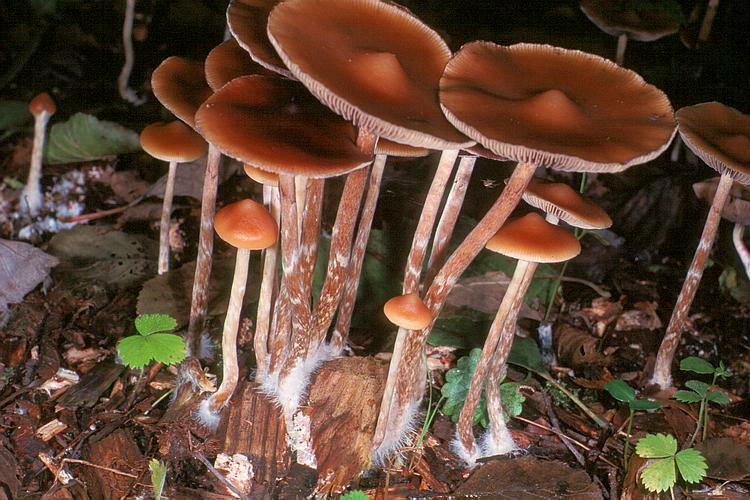 Base of stem thickening downwards, often curved, and characterized by coarse white aerial tufts of mycelium, often with azure tones. 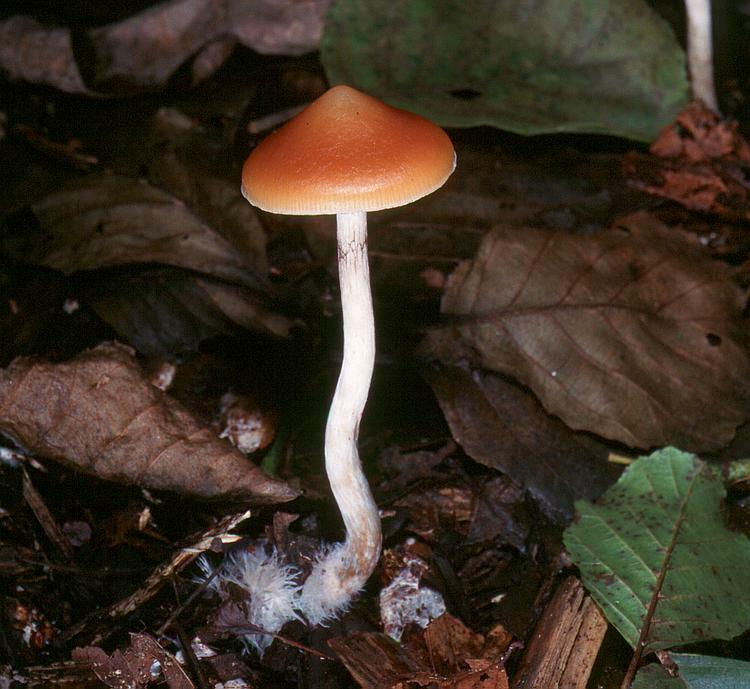 Mycelium surrounding stipe base densely rhizomorphic, silky white, tenaciously holding the wood-chips together, strongly bruising bluish upon disturbance. Clamp connections abundant. Ixocutis gelatinous, hyaline hyphae, 1.5 - 5.5um in diameter. Sub-pellis a brownish band, more highly pigmented than pileal trama. Lamellar trama regular, composed of hyphae 5 - 15 um in diameter, slightly encrusted with brown pigments; subhumenium a subcellular compact layer, 10um thick. Pileal trama 5 - 15um thick. Pleurocystidia abundant, fusoid-ventricose, tapering to a narrow but short neck, bluntly papillate, 23-35 x 9-10 um. Cheilocystidia forming a nongelatinized sterile band, nearly identical to pleurocystidia measuring 23-28 x 6.5-8.0 um. Basidia 4-spored, measuring 27-30.5 x 6.3-7.2 um. Spores 12-13.5 x 6.5-8.0 um, rich reddish brown in KOH and light purplish vinaceous in aqeous ammoniacal solutions. Wall thickness less than 1 um. Caulocystidia abundant above the annular zone and similar to pleurocystidia but thicker walled and more irregular, measuring 43um long with undulated necks. Cortial hyphae on stipe slightly thickened, almost subgelatinized walls, 3 - 5 um in diameter with clamps and brown intra-perital pigment. Caulocystidia absent below annular zone. Tissue notably awash with bluish tones. Late September through December, usually starting when the temperatures drop to the 40F range after a rain. You will find these only in a small area along the coast of Washington and Oregon, the mouth of the colombia is the best. They grow on alder and in grasses where there is a high lignin content. Dune grasses are another area which are very good for P. azurescens. Cespitose to gregarious in tight clusters, also singularly and spaced in the natural habitat of the coastal dune grasses. Bruising bluish black upon handling, this species is so potent it stains very heavily. "You need to look for azures on the coast if you have a chance. Same with cyans, but when you get into a good area, it's mind blowing" (NeoSporen). 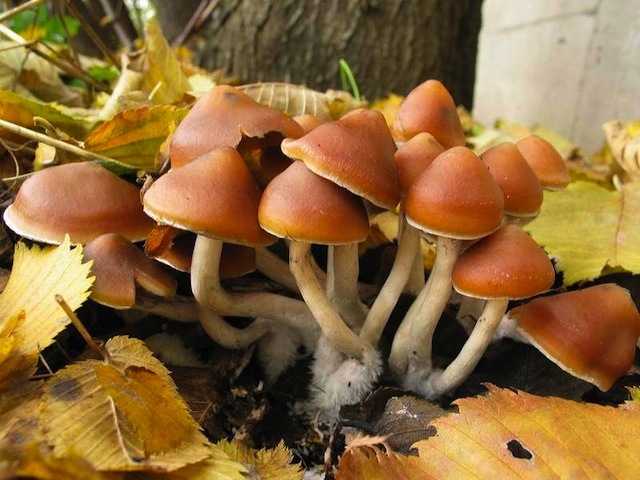 It is among the most potent of the tryptamine-bearing mushrooms, containing up to 1.8% psilocybin, 0.5% psilocin, and 0.4% baeocystin by dry weight, averaging to about 1.1% psilocybin and 0.15% psilocin.